Mouse CD1 (mCD1) glycoproteins are known to present peptides, while human CD1 molecules present glycolipids. In mice, mCD1-autoreactive NK T cells play critical roles in various immune responses, through the secretion of high amounts of cytokines. This study was initiated to determine whether glycolipids are involved in the autorecognition of mCD1 by NK T cells. α-Galactosylceramide (α-GalCer) was the only glycolipid tested capable of eliciting an mCD1-restricted response by splenic T cells. Moreover, splenic T cells derived from mCD1-deficient mice were not stimulated by α-GalCer, suggesting that the responsive T cells are selected by mCD1. Using cytoflow techniques, we confirmed that, in response to α-GalCer, IFN-γ-secreting cells displayed an NK T cell phenotype. The predominance of IFN-γ vs IL-4, however, is determined by the type of mCD1+ APC, suggesting the potential for APC regulation of cytokine production by NK T cells. Among a panel of 10 mCD1-autoreactive T cell hybridomas, only the ones that express the typical Vα14Jα281 TCR rearrangement of NK T cells responded to α-GalCer. Fixation or treatment of mCD1+ APCs with an inhibitor of endosomal acidification and the use of mCD1 mutants unable to traffic through endosome still allowed α-GalCer to stimulate NK T cells. Thus, endosomal trafficking and Ag processing are not required for glycolipid recognition. In summary, α-GalCer might be the autologous ligand, or a mimic of a glycolipid ligand, involved in the mCD1-mediated stimulation of NK T cells. CD1 proteins are heterodimers consisting of an approximately 45-kDa glycosylated heavy chain that interacts noncovalently with the β2-microglobulin (β2m)4 light chain (1). Despite this feature typical of class I molecules, CD1 molecules display some unique characteristics: they are encoded by genes outside the MHC, they are nonpolymorphic, and they are nearly as related in primary sequence to class II molecules as they are to class I molecules (1, 2). Like class II molecules, several different types of CD1 molecules have been shown to traffick through endosomes. A tyrosine-containing sequence in the cytoplasmic tail of human CD1b and mouse CD1 (mCD1) directs this endosomal localization (3, 4). Finally, assembly and transport of CD1 glycoproteins occur independently of either TAP (5, 6) or the invariant chain, which are required for optimal trafficking of class I and class II molecules, respectively. In the mouse, CD1 molecules are constitutively expressed by nearly all hemopoietic cells, including B and T lymphocytes, macrophages, and dendritic cells (DC) (7). Consistent with their MHC Ag-presenting molecule-like structure (8), and their expression by APCs, CD1 molecules have been described as target Ag for T cell recognition (reviewed in Refs. 1, 9, and 10). Two different types of CD1-reactive T cells have been identified in the mouse. The first group is reactive with peptides that have a hydrophobic mCD1-binding motif (11, 12). These cells are similar to conventional CTL, in that they are TCRαβ+ and CD8+, they are cytolytic, and they secrete IFN-γ. The second group of T lymphocytes are mCD1 autoreactive in vitro, and they are either CD4+ or double negative. Among the mCD1-autoreactive T cells, the NK T cells have been a recent focus of interest (10). The NK T lymphocytes are a specialized subset of cells, representing 4% of splenocytes, 10 to 20% of mature thymocytes, and up to 30 to 50% of liver and bone marrow T cells. In addition to their intermediate level of TCR expression and their activated/memory-like phenotype, NK T cells are distinguished by their expression of receptors of the NK lineage, particularly NK1.1 (CD161) (10, 13). The majority of NK T cells use either the Vβ8, Vβ7, or Vβ2 β-chain paired with an invariant Vα14Jα281 rearrangement, thereby considerably restricting the diversity of their TCR repertoire (14, 15). A human counterpart of the mouse NK T cells has recently been identified. It expresses a restricted TCR repertoire that is homologous to the predominant one expressed by mouse NK T cells, and these T cells are autoreactive for human CD1d (16). Considering the striking ability of NK T cells to rapidly secrete large amounts of cytokines, especially IL-4 (17), they were initially thought to initiate Th2 immune responses (18, 19). Mice deficient for mCD1 or β2m develop normal Th2 responses, however, although both the number of NK T cells and the levels of IL-4 induced early upon injection of anti-CD3 Ab are dramatically reduced (20, 21, 22). Numerous recent reports suggest an important role for NK1.1+ or Vα14+ T cells in various aspects of either the regulation or the effector phase of immune responses, including the prevention of tumor metastases (23, 24, 25, 26), the regulation of autoimmune diseases (27, 28, 29, 30), and the protection against bacterial or parasitic infections (31, 32, 33, 34). Therefore, NK T cells might represent part of the first line of defense against infection, and/or a regulatory cell type playing a pivotal role between innate and adaptive immunity. Although CD1-restricted human T cells specific for glycolipid Ags have been described by a number of investigators (35, 36, 37, 38), mouse T cells reactive with glycolipids have not been well characterized previously. In addition, the requirement for a specific mCD1-bound Ag for the activation of NK T cells was not established. The heterogeneity of these mCD1-autoreactive T cells with regard to their ability to react to various mCD1+ cell types and transfectants suggests, however, that they could require members of a set of autologous mCD1-bound ligands (4, 39, 40). These ligands could be either peptides or glycolipids. Recently, using Jα281-deficient mice that cannot make the invariant Vβ8/Vα14Jα281 TCR, or TCR transgenic mice in which this is the only Ag receptor, Kawano et al. showed that a Vα14+ TCR responds to the synthetic glycolipid α-galactosylceramide (α-GalCer) (41). A role for mCD1 in the presentation of α-GalCer was suggested by the results of Ab-blocking studies and by the ability of APC from TAP-deficient mice, but not from β2m-deficient mice to stimulate the Vα14+ T cells. In this study, we demonstrate that α-GalCer-reactive NK T cells also are readily detectable in the spleen of normal, unimmunized mice. Using mCD1 transfectants and mCD1-deficient mice, we rigorously demonstrate the mCD1 restriction of such α-GalCer-specific immune responses. We further show that this T cell-mediated immune response is associated with the Vα14Jα281 rearrangement, but is not dependent upon the expression of Vβ8. By a variety of methods, we report that α-GalCer, which contains only a single sugar attached to a ceramide with C18 sphingosine base and C26 fatty acyl chains, does not require either Ag processing or endosomal uptake to be presented by mCD1. Furthermore, our data indicate that the type of cytokines secreted by the NK T cells depends upon the context in which the Ag-specific stimulus is delivered. In summary, the data suggest that mCD1 molecules can present glycolipids as well as peptides, and that the majority of NK T cells may be reactive with such nonpeptide Ags. The α- and β-galactosylceramides, α-GalCer and β-GalCer, respectively (42), were synthesized by Pharmaceutical Research Laboratories, Kirin Brewery (Gumna, Japan). Both preparations had a single dominant peak of the expected m.w. by electrospray mass spectrometry, ruling out the presence of significant amounts of degradation products. l-α-phosphatidylinositols from bovine liver were purchased from Sigma (St. Louis, MO). Mannose-capped lipoarabinomannan (LAM), purified from Mycobacterium tuberculosis strain H37Rv, was provided by Dr. John Belisle (Colorado State University, Fort Collins) through National Institute of Health Contract 1-AI-25147. Synthetic phosphatidylinositol dimannoside (PIM2) has been described elsewhere (43) and was kindly provided by Dr. Y. Watanabe (Ehime University, Matsuyama, Japan). All of the compounds, except LAM, which is soluble in PBS, were dissolved in 100% DMSO. A control 100% DMSO vehicle solution was therefore routinely tested in parallel with the glycolipids. The following mAbs used in the cytokine ELISAs were purchased from PharMingen (San Diego, CA): anti-IFN-γ mAbs (purified R4-6A2 and biotinylated XMG1.2), anti-IL-4 mAbs (purified BVD4-1D11 and biotinylated BVD6-24G2), and anti-IL-2 mAbs (purified JES6-N37-1A12 and biotinylated JES6-5H4). The cytokine standards consisted of the corresponding recombinant IFN-γ, IL-4, and IL-2 (107 U/mg; PharMingen). The biotinylated XMG1.2 anti-IFN-γ mAb also was used for intracellular cytokine measurements. The blocking anti-CD1 mAb 1B1 was produced in our laboratory (7), and its isotype-matched mAb (IgG2b, κ, clone 49.2) was obtained from PharMingen. The following mAbs, used for phenotypic analysis of lymphocytes, were purchased from PharMingen: anti-CD16/32 clone 2.4G2, FITC-labeled anti-β TCR clone H57-597, PE-labeled anti-NK1.1 clone PK136, PE-labeled anti-CD44 clone IM7, PE-labeled anti-CD122 clone TM-b1, biotinylated anti-CD69 clone H1-2F3, PE-labeled anti-Vβ8.1-Vβ8.2 TCR clone MR5-2, and biotinylated anti-Vβ10 TCR clone B21.5. Mice with a disrupted TAP1 gene (TAP-deficient mice) on the mixed C57BL/6 × 129 background were obtained from Dr. Luc van Kaer (Vanderbilt University, Nashville, TN). The CD1-deficient mice on the mixed BALB/c × 129 background have been described previously (20). β2m-deficient mice were kindly provided by Dr. Beverly Koller (University of North Carolina, Chapel Hill, NC). All mice were housed and bred from stock under specific pathogen-free conditions in La Jolla Institute of Allergy and Immunology Vivarium (San Diego, CA). The A20 B cell lymphoma, the J774 monocytic cells, and the RMA-S thymocyte cell line were obtained from American Type Culture Collection (Manassas, VA). mCD1 transfectants of these cell lines were obtained in the laboratory, as previously described (4). The EL-4 and EL-4 CD1.1-transfected cell lines were kindly provided by Dr. M. Corr (University of California, San Diego). Cell lines and freshly isolated primary cell suspensions were maintained and cultured in RPMI 1640 or DMEM from Life Technologies (Grand Island, NY), supplemented with 10% heat-inactivated FCS (Omega Scientific, Tarzana, CA), 2 mM l-glutamine/100 U/ml penicillin (Life Technologies), 2 mM sodium pyruvate (Irvine Scientific, Santa Ana, CA), and 50 mM 2-ME (Fisher Scientific, Pittsburgh, PA). The construction of the cytoplasmic tail mutant CD1.1 TD and its expression in A20 cells have been described elsewhere (4). For DC enrichment, spleen cell suspensions were incubated for 1 h with 400 U/ml of type III collagenase (Sigma), washed, and allowed to adhere onto plastic of tissue culture flasks at 107 cells/ml in culture medium for 1 h, 30 min at 37°C, 5% CO2. Nonadherent cells were then removed, and adherent cells were reincubated overnight with 80 ng/ml of α-GalCer or with the vehicle only. The cells that became nonadherent during the secondary culture period were recovered and centrifuged over a 50% Percoll gradient (Pharmacia Biotech AB, Uppsala, Sweden). Such a purified population contained more than 80% of DC, as identified by morphology and flow cytometry (CD16/32low, CD11c+, CD11blow, MHC class IIhigh). Purified splenic DC cells also express high levels of mCD1 (mean fluorescence intensity > 1000), as determined by flow cytometry. Pulsed DC were washed extensively before being added to the cultures. Fixation of APCs was performed as follows: cells were washed, resuspended in PBS at 107/ml, and then fixed with 0.05% glutaraldehyde (Sigma) for 30 s with intermittent vortexing. One volume of 0.2 M l-lysine (pH 7.4 in H2O) was added and incubated for 2 min. Cells were then washed in complete medium before being added to the assays. To block endosomal acidification, APCs were treated with 10 to 50 nM concanamycin A (Folimycin, Kamida Biomedical, Ventura, CA) 1 h before Ag addition or 2 h after Ag addition (positive control) over a 3-h incubation time. Before being added to the cultures, cells were washed extensively in complete medium. For measurement of mCD1-restricted T cell responses to glycolipids, spleens were excised from animals, and single cell suspensions were prepared by grinding the organs between the frosted ends of two glass slides in complete medium. RBCs were removed before culture or analysis using a standard Ficoll gradient (lympholyte-M; Accurate Chemical & Scientific, Westbury, NY). For cytokine detection and proliferation experiments, splenic cell suspensions were seeded at 1 to 5 × 105 cells/well in 96-well plate. mCD1+ transfectants, control parental cell lines, or primary APCs were pulsed for 2 to 3 h at 37°C with glycolipids, then irradiated (7000 rad) and extensively washed before being added at 2 to 6 × 104 cells/well, as indicated in the figure legends. The blocking anti-CD1 mAb 1B1 and its isotype-matched mAb were added at 10 μg/ml, 30 min before the addition of the responder spleen cells. Supernatants were harvested at indicated time points, and cytokine levels were assessed by ELISA. For flow-cytometric analysis, cells were seeded in bulk cultures at 5 × 106 cells/ml in 25-cm2 flasks or six-well plates. The derivation and characterization of the mCD1-autoreactive hybridomas have been described previously (4, 39). The hybridomas 68, 19, and 24 originated from the remnant CD4+ splenic T cell population in class II-deficient mice. The hybridomas DN3A4-1.4 and DN3A4-1.2, generously provided by Dr. M. Bix (University of California, San Francisco), and N38-2C12, N38-3C3, N37-2D5, N38-2H4, and N37-1A12 (Ming Gui, manuscript in preparation) are all derived from C57BL/6 NK1.1+ thymocytes. As determined by PCR sequencing, hybridomas DN3A4-1.4, DN3A4-1.2, N38-2C12, N38-3C3, N37-2D5, and N38-2H4 express the typical Vα14Jα281 rearrangement, while hybridomas N37-1A12, 19, 68, and 24 do not. For the assays, T cell hybridomas were cultured at 5 × 104 cells/well in the presence of APCs pulsed with glycolipids or their respective controls, with or without blocking anti-CD1 mAb or isotype-matched mAb, as indicated in the figure legends. Supernatants were tested for IL-2 by ELISA after 16 h of stimulation. The cytokine levels in cell culture supernatants were detected using standard sandwich ELISAs with a coated capture mAb and a biotinylated detection mAb, according to the manufacturer protocol (PharMingen). Cytokine levels are expressed as mean ± SD of culture triplicates. For cell surface staining, cells were suspended in buffer comprised of PBS, pH 7.4, containing 2% BSA (w/v) and 0.02% NaN3 (w/v). After 10 min of preincubation with the blocking 2.4G2 mAb, the cells were stained at 4°C for 20 min with the labeled mAb. After three washes, cells were resuspended in staining buffer and analyzed on a Becton Dickinson (San Jose, CA) FACScan 440 flow cytometer. Lymphocytes were enumerated out of the heterogeneous cell population by electronic gating on the lymphocyte population, as determined by analysis of forward angle and side angle light scatter. For extracellular staining combined with intracellular cytokine analysis, cells were cultured for the last 6 h of stimulation in the presence of 5 μg/ml of brefeldin A (ICN, Costa Mesa, CA). Cells were then washed, blocked with the anti-FcγR mAb, and stained for extracellular markers with FITC- and/or PE-conjugated mAbs. After three washes, cells were fixed 20 min in PBS, pH 7.3, with 0.02% (w/v) NaN3 and 4% (w/v) paraformaldehyde (Sigma), and then permeabilized by two washes in PBS, pH 7.3, with 0.02% (w/v) NaN3 and 0.13% saponin (Sigma, St. Louis, MO), followed by incubation for 30 min in this permeabilization buffer with a biotinylated anti-IFN-γ mAb or an isotype-matched mAb in the presence of the blocking 2.4G2 mAb. After two washes, cells were further incubated for 10 min in permeabilization buffer with tricolor-streptavidin (Caltag, South San Francisco, CA), washed once in permeabilization buffer, and twice in staining buffer before being resuspended in staining buffer for analysis. As a specificity control, preincubation of the biotinylated anti-IFN-γ mAb with rIFN-γ before intracellular staining completely abrogated the tricolor (intracellular cytokine) signal. Two types of glycolipids were tested for their ability to stimulate freshly isolated mouse splenic T cells. The first group of compounds consists of phospholipids, including phosphatidylinositol (PI), and a synthetic PIM2, which is a PI with two additional α-D mannose groups (43). We also tested LAM purified from M. tuberculosis. LAM is a macromolecule that contains a PI group linked to a mannose-rich core, which in turn is connected to a polysaccharide with highly branched arabinofuranosyl side chains (44). This set of compounds was chosen because LAM and compounds closely related to PIM2 are Ags for human CD1b-restricted T cells (38, 45). The second set of Ags are galactosylceramides with either an α- or β-linked galactose residue. α-GalCer was reported to stimulate T cells, possibly including some NK T cells (46, 47, 48), and it activates T cells from transgenic mice expressing a Vβ8/Vα14 TCR (41). In a first set of experiments, these two groups of glycolipids were tested over a 3-day culture period with unfractionated splenic cells freshly isolated from unimmunized TAP-deficient mice. TAP-deficient mice were initially selected to prevent any potential class I-mediated repression of the activation of T cells that express NK receptors. While they emerged as the genetic background that responded the most strongly in all of the tests described hereafter (see below), cells from several other TAP+ mouse strains conducted responses with the same specificity. α-GalCer was distinguished from the other glycolipids on account of its striking capacity to induce the secretion of high amounts of both IFN-γ and IL-4 (Fig. 1⇓A). Indeed, α-GalCer induced 30.1 ± 29 (range 5.9 to 101, n = 9)-fold more IFN-γ and 22.3 ± 15.9 (range 8.7 to 58, n = 9)-fold more IL-4 than the controls. Interestingly, β-galactosylceramide (β-GalCer) did not induce cytokine secretion, indicating that the anomeric conformation of the sugar moiety is critical for this process. This requirement for the α-anomeric conformation is consistent with previous results (41). Furthermore, our results demonstrate that the cytokine secretion induced by α-GalCer is not particular to the rearranged V-D-J Vβ8 TCR expressed in the transgenic mice. The level of cytokines obtained following addition of LAM, PIM2, or PI did not significantly differ from the control levels. Thus, among the different glycolipids tested, only α-GalCer is able to stimulate splenic cells from unimmunized mice to produce what are likely to be T cell-derived cytokines. To determine whether spleen cell responses to α-GalCer are mCD1 mediated, we conducted Ab-blocking studies. IL-4 and IFN-γ secretion induced by α-GalCer were both significantly and reproducibly inhibited by the addition of a blocking anti-CD1 mAb, while the isotype-matched mAb was inactive (Fig. 1⇑B). The secretion of IFN-γ was more greatly affected by the anti-CD1 treatment (82% ± 15.6, range 59 to 92, n = 4) than the production of IL-4 (68.4% ± 20, range 50 to 89, n = 4). The inhibitory effect was not due to nonspecific cytotoxicity because the anti-CD1 mAb did not affect the cytokine levels induced by MLR to MHC allogenic stimulators, using the same spleen cell suspensions as responder cells (data not shown). Almost all cells in the spleen express mCD1 (7), and the APC type in the spleen responsible for α-GalCer presentation has not been determined. To further demonstrate a role for mCD1 in mouse glycolipid responses, we used mCD1 transfectants of both A20, a B cell lymphoma, and RMA-S, a TAP-2-deficient thymoma. In these experiments (Fig. 2⇓A), the APCs were pulsed for 3 h with Ag, washed, irradiated, and then added to cultures of spleen cells freshly isolated from unimmunized mice on the mixed BALB/c × 129 background. 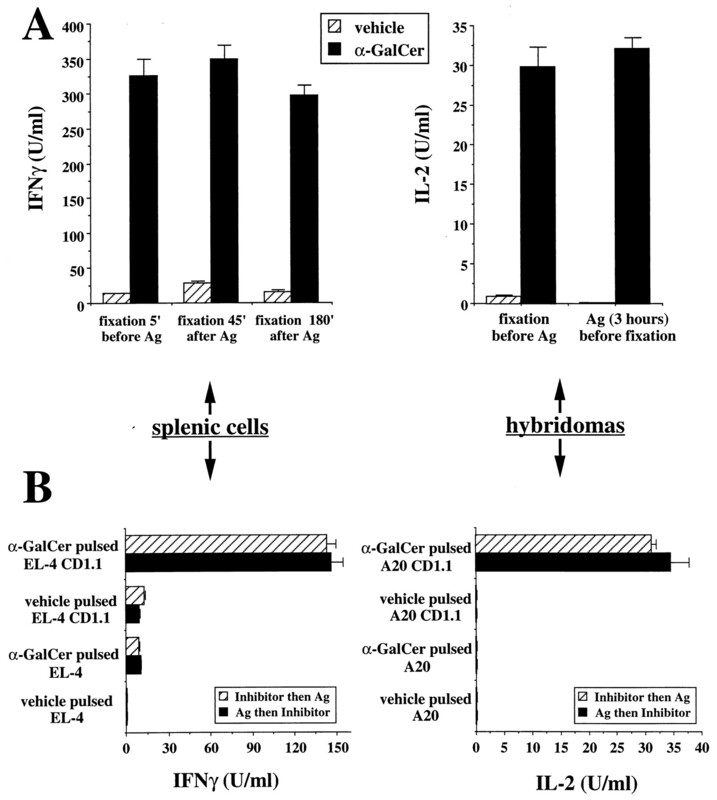 No IL-4 secretion was observed in any of the experiments with these mCD1 transfectants (<9 pg/ml), but once again, α-GalCer was the only glycolipid to induce IFN-γ secretion by splenic cells. The level of responsiveness correlated with the level of mCD1 expression by the APCs. Untransfected A20 cells, which do not express detectable mCD1 by flow cytometry, completely fail to initiate any splenic T cell stimulation after incubation with α-GalCer. Untransfected RMA-S cells, which express low levels of mCD1 (7), were able to noticeably increase the production of IFN-γ from a background of 6.8 U/ml up to a level of 47 U/ml following incubation with α-GalCer. Finally, CD1.1-transfected A20 and RMA-S cells were highly potent inducers of IFN-γ secretion when pulsed with α-GalCer. The response to α-GalCer is dependent upon mCD1+APCs. A, mCD1-transfected A20 cells (left panel) and RMA-S cells (right panel), and their respective untransfected controls, were pulsed with either α-GalCer, β-GalCer, PIM2, PI, LAM, or their respective vehicles, at the same concentrations as described in Figure 1⇑. Ag-pulsed, irradiated APCs were added at 5 × 104 cells/well to splenic cells derived from mice on the mixed BALB/c × 129 background, and seeded at 2.5 × 105 cells/well. After 3 days of culture, supernatants were tested in the IL-4 and IFN-γ ELISAs (n = 6). B, RMA-S cells, CD1.1 transfected or not, were pulsed with increasing doses of α-GalCer and plated at 5 × 104 cells/well with splenic cells from TAP-deficient mice at 2.5 × 105 cells/well. Some Ag-pulsed RMA-S CD1.1 transfectants were first preincubated for 30 min with 10 μg/ml of either a blocking anti-mCD1 mAb or an isotype-matched control mAb before being added to the spleen cells. The 3-day culture supernatants were measured for IFN-γ by ELISA (n = 3). This induction of IFN-γ by α-GalCer-pulsed mCD1 transfectants is dose dependent (Fig. 2⇑B). With CD1.1-transfected RMA-S cells, α-GalCer was effective at doses as low as 0.1 ng/ml, corresponding to a concentration in the 100 pM range; the half-maximal level was obtained with less than 0.3 ng/ml; and 3 to 10 ng/ml allowed an optimal stimulation of IFN-γ secretion. With the relatively low level of mCD1 expression on untransfected RMA-S cells, 50- to 100-fold more Ag was required to achieve the same responses. Moreover, the addition of the blocking anti-CD1 mAb to the APCs pulsed with α-GalCer almost completely abrogated (>95%) the secretion of IFN-γ, using RMA-S CD1.1 as APCs (Fig. 2⇑B) or untransfected RMA-S (data not shown). It is worth noting that, in the absence of glycolipid, a 10-fold enhancement of IFN-γ secretion was reproducibly observed following stimulation of spleen cells with the CD1.1-transfected RMA-S cells compared with untransfected RMA-S (Fig. 2⇑A). Moreover, this mCD1 autoreactivity was blocked by a neutralizing anti-CD1 mAb (Fig. 2⇑B). These data suggest that mCD1 autoreactivity in vitro can be found in normal T cells as well as T cell hybridomas, consistent with a previous report (49). To more directly prove that the response to α-GalCer is mediated by mCD1, we took advantage of the availability of mCD1-deficient mice. α-GalCer was added directly to cultures of spleen cells derived from the MHC-matched mCD1+/+ control littermates, as described in Figure 1⇑, without any Ag-pulsed exogenous APCs. Addition of glycolipid Ag in this way was able to cause the induction of 745 U/ml of IFN-γ and more than 1050 pg/ml of IL-4 secretion from these wild-type mice on the mixed BALB/c × 129 background. The similar addition of α-GalCer to cultures of unfractionated spleen cells from mCD1-deficient mice did not induce cytokine production above the background level obtained without Ag (10 U/ml for IFN-γ, and 10 pg/ml for IL-4). To determine whether the defect in the cultures of cells from mCD1-deficient mice was at the level of the APCs, splenic DC were purified either from mCD1-deficient mice, or from their control littermates, they were pulsed with optimal doses of α-GalCer or its control vehicle, and they were then compared for their ability to induce cytokine secretion by splenic cells freshly isolated from control littermate mice (Fig. 3⇓A). DC isolated from mCD1+/+ controls strongly enhanced IFN-γ and IL-4 secretion when pulsed with α-GalCer. By contrast, no significant induction of cytokine production by α-GalCer was detected when DC isolated from mCD1-deficient mice were used as APCs. Moreover, high levels of IFN-γ, but no IL-4, were detected when the same wild-type responders were stimulated with CD1.1-transfected A20 cells that were pulsed with α-GalCer (Fig. 3⇓A). mCD1 expression is required for α-GalCer responsiveness. DC were isolated from the spleen of mCD1-deficient mice or from their control littermates, and pulsed with α-GalCer or its vehicle. As controls, A20 cells transfected with CD1.1 or the parental control cell line were pulsed with α-GalCer or its control. These Ag-pulsed APCs were then seeded at 6 × 104 cells/well with responder spleen cells purified from control littermates (A) or from mCD1-deficient mice (B), at 2.5 × 105 cells/well. After 3 days of culture, IL-4 and IFN-γ levels were assayed by ELISAs (n = 3). We conducted experiments to determine whether splenic responder cells from the mCD1-deficient mice were capable of responding to α-GalCer. The same α-GalCer-pulsed APCs described in Figure 3⇑A were tested in parallel with spleen cells from the mCD1-deficient mice. As shown in Figure 3⇑B, mCD1+ APCs completely failed to induce the secretion of either IFN-γ or IL-4 by mCD1−/− splenic cells. Identical results were obtained when responders from β2m-deficient mice were used (data not shown). In conclusion, the failure of spleen cells from mCD1-deficient mice to respond to α-GalCer is due both to a defect at the level of the APC, which is likely to reflect a failure to present Ag, and to a defect in the splenic responders, which is likely to reflect a failure to positively select mCD1-restricted T cells. The NK T cell subset is reduced dramatically in mCD1-deficient mice (20, 21, 22). We therefore examined whether lymphocytes belonging to this subpopulation are the predominant cell type stimulated by α-GalCer. Spleen cells from TAP-deficient mice were cultured in bulk with α-GalCer or β-GalCer as a control. These cells were then stained at different time points for the presence of intracellular cytokines combined with cell surface phenotyping to identify NK T cells. The efficiency and sensitivity of this method were validated by the detection of up to 25% IFN-γ-secreting cells when spleen cells were polyclonally activated by PMA and ionomycin (data not shown). The percentage of NK T cells increased only slightly in response to in vitro culture with α-GalCer, but did not increase at all with β-GalCer (Fig. 4⇓A). Because the NK1.1 marker may be lost upon activation (50), we also monitored any expansion of NK T cells by combining TCRαβ staining, to detect the intermediate levels of TCR expression characteristic of this lymphocyte subpopulation, with stainings specific for other typical markers of NK T cells: CD122 (IL-2R β-chain), Ly-49C, Vβ8, Vβ7, or Vβ2, and high levels of CD44. No more than a two- to threefold increase in the percentage of NK T cells or NK-like T cells was observed at time points ranging from 16 h to 3 days of in vitro culture with the stimulatory glycolipid. The spleen cells responsive to α-GalCer are NK T cells. Spleen cells from TAP-deficient mice were cultured at 5 × 106/ml with 80 ng/ml of α-GalCer or β-GalCer as a control. After 36 h, the cells were stained for both cell surface phenotype and intracellular cytokine content. A, Double staining with FITC-conjugated anti-TCRαβ mAb and PE-conjugated anti-NK1.1 mAb. The data were acquired on 4 × 104 cultured cells. The percentage of NK T cells is given in both cases. B, Dot plots analyzing the staining of NK T cells gated in A, with biotinylated anti-IFN-γ mAb/streptavidin-tricolor along with the forward angle light scatter parameter indicative of size. The percentage of NK T cells secreting IFN-γ is indicated in the upper panel. The settings were determined using control stainings with an isotype-matched biotinylated mAb. The percentage of IFN-γ-secreting cells was enhanced upon α-GalCer stimulation, although it usually represented no more than 3% of the total cell population (data not shown). When only NK T cells were analyzed, by gating on NK1.1+ TCRαβ intermediate cells (Fig. 4⇑A), we reproducibly detected a 10-fold increase in the percentage of IFN-γ-secreting cells upon stimulation with α-GalCer compared with the controls (Fig. 4⇑B). Furthermore, a majority of these IFN-γ-producing cells were activated, as revealed by their increased size. The remaining NK1.1− splenic cell population contained less than 5% of IFN-γ-secreting cells. 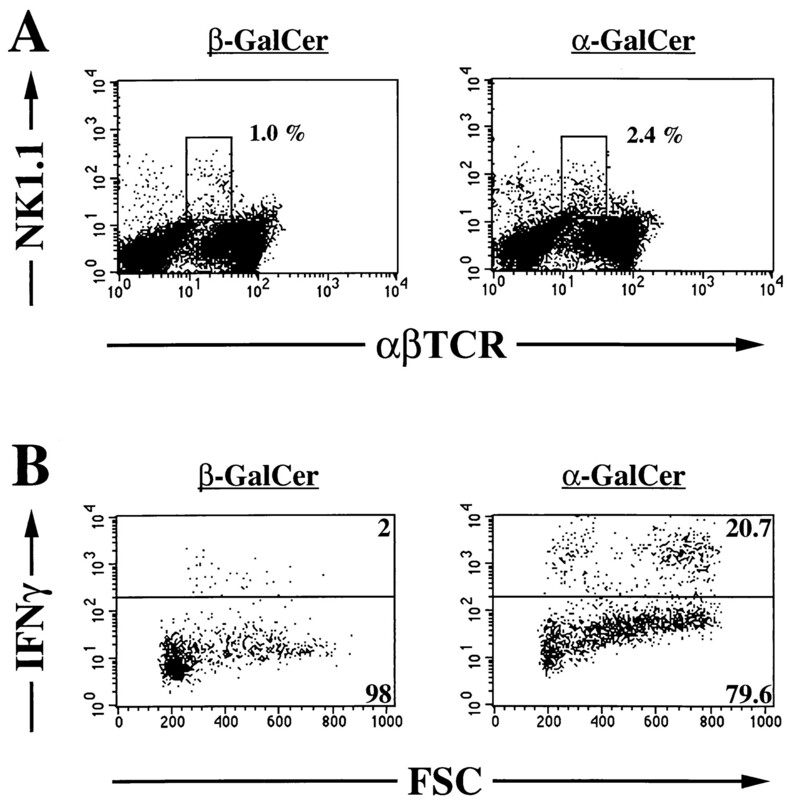 The percentage of IL-4-secreting cells in the total spleen cell population induced by culture with α-GalCer was even lower than for IFN-γ, and was close to the detection limit of the technique. Most of the IL-4-secreting cells also were positive for IFN-γ (data not shown), suggesting that some α-GalCer-activated NK T cells may secrete both IL-4 and IFN-γ. Thus, the high levels of IFN-γ and IL-4 induced by an mCD1-mediated stimulation with α-GalCer are actually secreted by relatively few cells, which belong predominantly to the NK T cell subset. The T cell response to α-GalCer was further analyzed at the clonal level with a panel of previously characterized mCD1-autoreactive T cell hybridomas. The mCD1-autoreactive hybridomas 19, 68, and 24 originated from the remnant CD4+ splenic T cell population in class II-deficient mice, and they do not express a Vα14 TCR (39). By contrast, the T cell hybridomas DN3A4-1.2, DN3A4-1.4, N38-3C3, N38-2D5, N37-2H4, N37-1A12, and N38-2C12 are derived from C57BL/6 NK1.1+ thymocytes, and they express the characteristic Vα14Jα281 rearrangement, except N37-1A12 (4). As described previously (4), although each of these hybridomas is mCD1 autoreactive, their ability to respond to a set of mCD1 transfectants and normal cell types is heterogenous, suggesting that they also may require one of a diverse set of autologous mCD1-bound ligands to be stimulated. As illustrated in Figure 5⇓, for some hybridomas, like 19, a α-GalCer pulse of A20 CD1.1 or J774 CD1.1 transfectants did not alter the low level of mCD1 autoreactivity observed with the vehicle-pulsed CD1.1 transfectants or untreated transfectants. The N38-2C12 hybridoma exhibited higher levels of spontaneous mCD1.1 autoreactivity, which were slightly increased by a pulse with α-GalCer. For other T cell hybridomas, like DN3A4-1.2, the low reactivity to CD1.1 transfectants was increased dramatically by a α-GalCer pulse. Finally, for other hybridomas, like N38-3C3, mCD1 autoreactivity was hardly detectable with vehicle-pulsed CD1.1 transfectants, but high levels of IL-2 were induced by the same APCs pulsed with α-Galcer. All of the α-GalCer-mediated enhancements of IL-2 secretion described above were blocked by the addition of an anti-CD1 mAb. Analysis of α-GalCer reactivity at the clonal level. The 19, N38-2C12, DN3A4-1.2, and N38-3C3 mCD1-autoreactive hybridomas were cultured at 5 × 104 cells/well with 2 × 105 CD1.1-transfected or not A20 or J774 cell lines, pulsed with α-GalCer or with the vehicle. IL-2 levels were assessed by ELISA after 16 h of culture (n = 4). A compilation of all of the data from a series of experiments done with the 10 mCD1-autoreactive T cell hybridomas and 3 different CD1.1 transfectants is presented in Table I⇓. On account of the variable level of mCD1 autoreactivity of these hybridomas, the data are expressed as a stimulation index. This was calculated as the ratio of the IL-2 production in the presence of the indicated α-GalCer-pulsed mCD1+ APC, to the IL-2 production with the same APC pulsed with the vehicle. 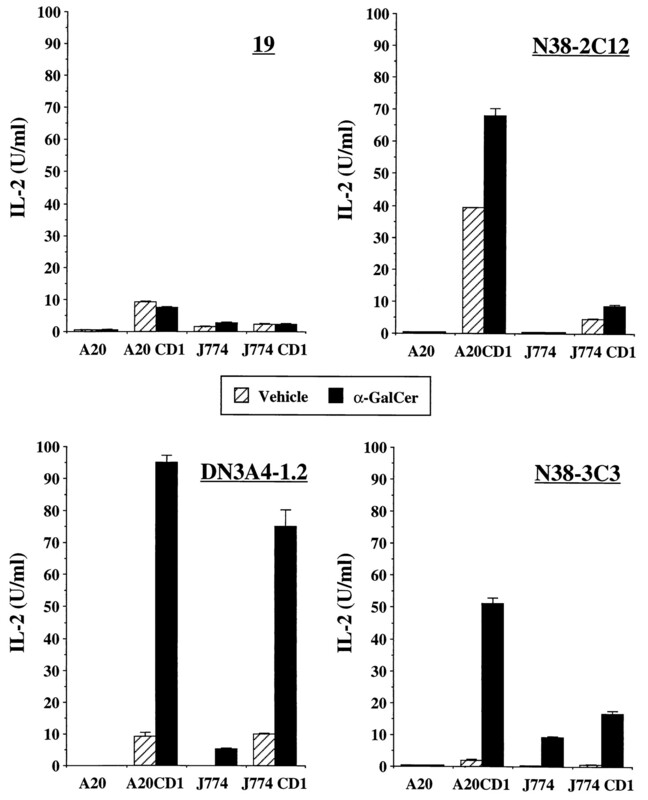 The data demonstrate that the four Vα14− hybridomas, 19, 68, 24, and N37-1A12, did not respond to α-GalCer, whatever the stimulating mCD1+ cell line tested (Table I⇓). In contrast, the six Vα14Jα281+ T cell hybridomas were all stimulated by α-GalCer (Table I⇓). N38-2C12 weakly and variably responded to α-GalCer, but for the five other Vα14 hybridomas, DN3A4-1.2, DN3A4-1.4, N38-3C3, N37-2D5, and N38-2H4, IL-2 production was greatly increased (approximately 5- to 90-fold) following addition of any α-GalCer-pulsed CD1.1 transfectants. This confirms that the reactivity to α-GalCer is restricted to Vα14+ NK T cells, including those expressing either Vβ8.1/8.2, Vβ8.3, Vβ7, or Vβ10. Consistent with the results obtained with fresh spleen cells, CD1.1 transfectants pulsed with either PIM2, PI, LAM, or β-GalCer did not augment the mCD1 autoreactivity of any of the mCD1-autoreactive T cell hybridomas (data not shown). Like normal thymocytes and splenic T lymphocytes (7), the T cell hybridomas described above express low to relatively high levels of mCD1 (Fig. 6⇓A). We therefore asked whether the mCD1+ hybridomas would be capable of self-presentation of α-GalCer (Fig. 6⇓A). None of the hybridomas were autostimulatory in the absence of Ag. When added directly to the cultures without APCs, α-GalCer was able to strongly induce IL-2 secretion by the NK T cell hybridoma DN3A4-1.2, which expresses relatively high levels of mCD1 (Fig. 6⇓A). The response to α-GalCer is dose dependent (Fig. 6⇓B), although higher amounts of α-GalCer were required to stimulate the NK T cell hybridomas compared with primary NK T cells (see Fig. 2⇑B). Incubation with an anti-CD1 mAb almost completely abrogated this α-GalCer-induced autostimulation, while the isotype-matched mAb was inactive, confirming that the response is mCD1 mediated (Fig. 6⇓B). A very similar self-presentation of α-GalCer was observed for the DN3A4-1.4 and N38-2H4 hybridomas, which also express significant levels of mCD1 (data not shown). By contrast, direct addition of α-GalCer to N38-2C12 or N38-3C3, Vα14+ hybridomas that are responsive to α-GalCer-pulsed CD1+ APCs, did not stimulate IL-2 secretion. This is probably due to their relatively low level of surface mCD1 expression (Fig. 6⇓A). The hybridoma 24, unresponsive to Ag-pulsed CD1.1 transfectants, also failed to self-present α-GalCer, although it expressed high levels of mCD1 (Fig. 6⇓A). Thus, NK T cell hybridomas expressing sufficient levels of mCD1 were capable of self-presentation of α-GalCer, and they were almost as effective at Ag presentation as CD1.1-transfected professional APCs. In addition, the data on self-presentation are consistent with the data using exogenous APC. The failure of hybridomas 24 (Fig. 6⇓), 19, 68, and N37-1A12 (data not shown) to self-present α-GalCer demonstrates that the inability to be stimulated by α-GalCer-pulsed APC (Fig. 5⇑) is not due to the achievement of a maximal level of stimulation by untreated mCD1+ APC. α-GalCer self-presentation by mCD1-autoreactive NK T cell hybridomas. A, The 24, DN3A4-1.2, N38-2C12, and N38-3C3 T cell hybridomas were cultured, at 1.2 × 105 cells/well, with 80 ng/ml of α-GalCer or β-GalCer. The histograms show the level of mCD1 expressed by each of these hybridomas at the time of the assay, with the isotype control staining profile indicated as a dotted line. IL-2 levels were tested after 16 h of culture (n = 3). B, The DN3A4-1.2 hybridoma was cultured at 1.2 × 105 cells/well with increasing doses of α-GalCer, in the absence or presence of 10 μg/ml of anti-CD1 mAb or its isotype-matched control mAb. IL-2 levels were measured by ELISA after 16 h (n = 3). Endosomal acidification (3, 51) and uptake of Ag (51) are necessary for the presentation of glycolipids to T lymphocytes by human CD1b. This may reflect a requirement either for glycolipid Ag processing, and/or for the optimal binding of Ag to CD1 molecules at acidic pH (45). To determine whether there might be a similar endosomal requirement for mCD1-mediated recognition of α-GalCer, we tested fixed mCD1+ APCs pulsed with α-GalCer for their ability to stimulate NK T cells. Ag-pulsed, glutaraldehyde-fixed RMA-S CD1.1 transfectants were cultured either with freshly isolated responder spleen cells or with mCD1-autoreactive T cell hybridomas. Fixed cells remained fully competent to stimulate the secretion of IFN-γ by primary splenic NK T cells (Fig. 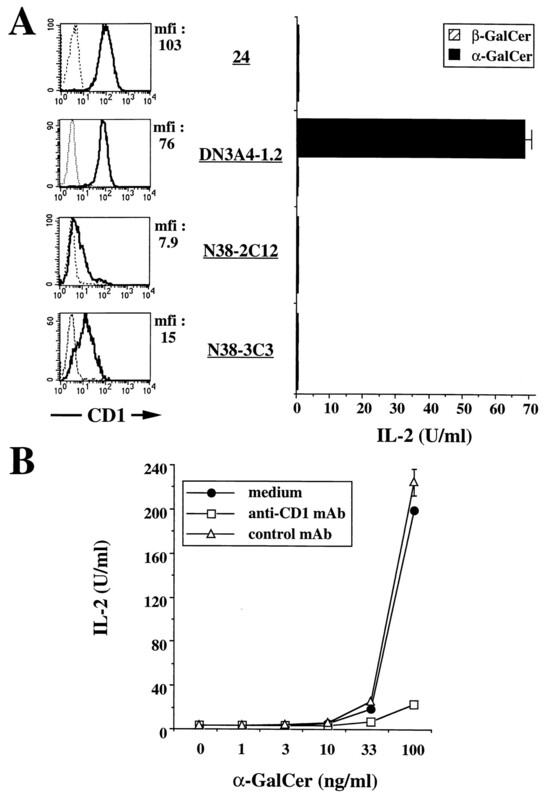 7⇓A, left) and the production of IL-2 by the Vα14+ T cell hybridoma DN3A4-1.2 (Fig. 7⇓A, right). Similar results were obtained with fixed CD1.1-transfected A20 cells. In a separate experimental system, the same fixed mCD1+ APCs retained their ability to present an mCD1-binding peptide, but they were unable to stimulate a response following addition of intact protein that contains the same peptide epitope (S. Tangri, L. Brossay, M. Corr, D. Lee, and M. Kronenberg, unpublished data). Unfixed transfectants could stimulate a response to either peptide or the intact protein. This demonstrates that the fixation conditions used with the CD1.1 transfectants were sufficient to prevent processing of protein Ags for mCD1 presentation. Endosomal uptake of Ag is not required for α-GalCer-specific T cell responses. A, RMA-S CD1.1 transfectants were fixed with glutaraldehyde before or at different time points after addition of either α-GalCer or vehicle. B, EL-4 cells and EL-4 CD1.1 transfectants (left) and A20 and A20 CD1.1 transfectants (right) were treated with 50 nM concanamycin A (Inhibitor) before or after incubation with either α-GalCer or vehicle. These treated APCs were plated at 5 × 104 cells/well with 3 × 105 splenic cells isolated from mice on the mixed BALB/c × 129 background (A and B, left), or were seeded at 3 × 105 cells/well with the DN3A4-1.2 hybridoma (A, right) or the N38-3C3 hybridoma (B, right) plated at 5 × 104 cells/well. ELISAs were used to measure IFN-γ levels recovered after 3 days of spleen cell culture (A and B, left) or IL-2 levels after 16 h of hybridoma culture (A and B, right) (n = 3). To further establish that no endosomal acidification is required for the stimulation of NK T cells by α-GalCer-pulsed CD1+ APCs, we assessed the effect of an inhibitor of endosomal acidification. CD1.1 transfectants treated with concanamycin A before the α-GalCer pulse retained their ability to fully stimulate the secretion of IFN-γ by unfractionated spleen cells (Fig. 7⇑B, left). 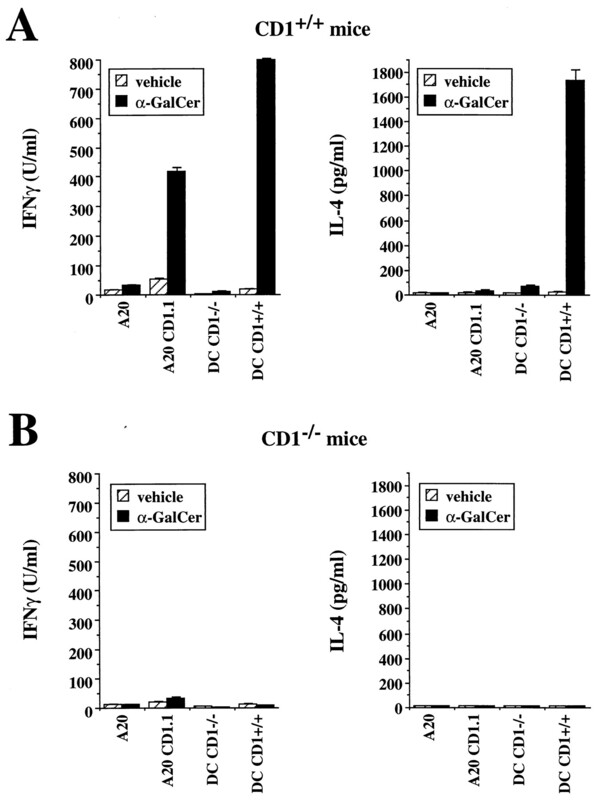 Concanamycin A-treated and α-GalCer-pulsed CD1.1 transfectants also were capable of enhancing IL-2 secretion by NK T cell hybridomas to a similar extent than the CD1.1+ APCs treated with concanamycin A after Ag addition (Fig. 7⇑B, right, for N38-3C3). Although they failed to inhibit the α-GalCer-mediated stimulation of NK T cells, the noncytotoxic concentrations of concanamycin A used, ranging from 10 to 50 nM, were capable of blocking the stimulation of D011.10, an MHC class II-restricted, OVA-specific, T cell hybridoma. Indeed, the production of IL-2 by D011.10 was inhibited by 71% when A20 cells were treated with 20 nM of concanamycin A before the addition of OVA (34 U/ml), compared with the same APCs similarly treated after the OVA pulse (115 U/ml). Finally, we used a mutant of mCD1, which has its intracytoplasmic motif of endosomal localization (YQDI) deleted by site-directed mutagenesis (4), to analyze the requirement for endosomal trafficking in presentation of α-GalCer. By confocal microscopy analysis, A20 cells transfected with this construct (A20 CD1.1 TD) did not have detectable mCD1 molecules in endosomes, although the surface levels of mCD1 expression were similar to those of wild-type transfectants (4). As a further indication of the altered intracellular trafficking of the mCD1 mutant, 2 of 10 mCD1-autoreactive hybridomas showed a reduced response against A20 CD1.1 TD transfectants compared with A20 transfected with wild-type CD1.1 (Ref. 4 and shaded bars in Fig. 8⇓B: 1.5 U/ml with A20 CD1.1 TD vs 12.8 U/ml with A20 CD1.1). As shown in Figure 8⇓A, α-GalCer-pulsed A20 CD1.1 TD transfectants were able to stimulate splenic NK T cells, as efficiently as the wild-type CD1.1 transfectants. Similarly, these tail-deleted CD1.1 molecules sustained a α-GalCer-mediated activation of the DN3A4-1.2 NK T cell hybridoma that was comparable with that mediated by wild-type CD1.1 molecules (Fig. 8⇓B). Tail-deleted mCD1 mutant efficiently presents α-GalCer to NK T cells. A20 cells that are untransfected, transfected with wild-type CD1.1 (A20 CD1.1), or tail-deleted CD1.1 (A20 CD1.1 TD) were pulsed with α-GalCer or the vehicle control and were cultured at 5 × 104 cells/well with A, spleen cells from mice on the mixed BALB/c × 129 background at 2.5 × 105 cells/well, or were seeded at 3 × 105 cells/well with B, the DN3A4-1.2 hybridoma plated at 5 × 104 cells/well. 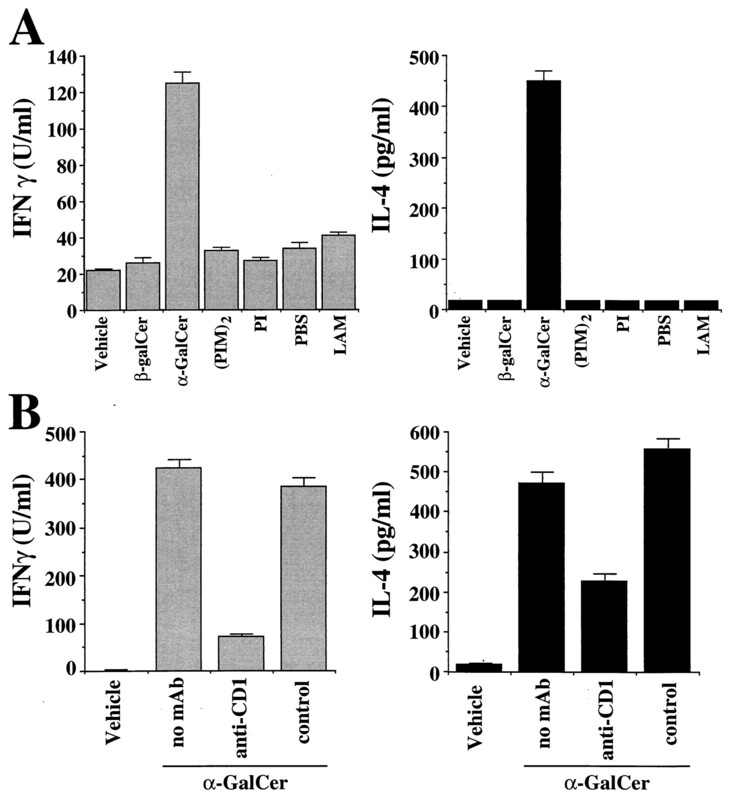 ELISAs were used to measure IFN-γ levels recovered after 3 days of spleen cell culture (A) or IL-2 levels after 16 h of hybridoma culture (B) (n = 3). Taken together, these data indicate that endosomal trafficking and Ag uptake are not required for the CD1-mediated presentation of α-Galcer to NK T lymphocytes. In this study, we have investigated the ability of mCD1 to mediate the reactivity of T cells to glycolipids. Based upon previous works conducted in humans (38, 52) and mice (41), two categories of glycolipids were selected: glycophospholipids and galactosylceramides. In addition, two T cell readout systems were used. We studied freshly isolated spleen cells, to detect a possible glycolipid-reactive repertoire in unimmunized mice, and we used mCD1-reactive hybridomas to analyze the immune response to nonpeptide Ags at the clonal level. We have extended the previous findings from TCR transgenic mice (41) by demonstrating that a significant repertoire of α-GalCer-reactive T cells is present in the spleen of naive mice. This glycolipid Ag induces only a modest proliferation (data not shown) and expansion in the reactive subpopulation, but it is a very potent inducer of cytokine secretion. Consistent with the previous results (41), β-GalCer is not stimulatory, indicating that the anomeric configuration of the sugar is critical for the activation. Furthermore, glycophospholipid-containing Ags were not stimulatory using either fresh spleen cells or the T cell hybridomas. This was surprising, as these compounds have been shown to be Ags for human CD1b-reactive T cells (38, 52), and recent studies have shown that synthetic PIM2 is capable of specific binding to soluble CD1b molecules in vitro (45). It is possible that mCD1 and human CD1b, which have diverged significantly (1, 2), present different types of lipid-containing Ags. However, a recent study (53) has used mass spectrometry, metabolic radiolabeling, and in vitro binding techniques to identify a glycosylphosphatidylinositol as a natural ligand of mCD1. Nonetheless, no evidence for T cell reactivity to a complex of mCD1 and this type of lipoglycan was reported in this study. Preliminary competition experiments failed to detect any inhibition of α-GalCer/mCD1-mediated activation of NK T cells by the glycolipids tested in our study, including LAM, PIM2, or PI. We cannot rule out that the experimental systems we have employed, which use only a single round of Ag stimulation or a restricted panel of hybridomas, might not be optimal to detect relatively infrequent LAM- or PIM2-specific mouse T cells. Indeed, most of the CD1-restricted human T cell lines responsive to these glycolipids were established from donors already sensitized to mycobacterial Ags (52, 54). Experiments are in progress to determine whether any mCD1-restricted responses can be raised in mice immunized with such glycophospholipids. Previous results using blocking Abs and APCs from TAP- and β2m-deficient mice implicated mCD1 in the immune response to α-GalCer (41). In this study, we have shown definitively that mCD1 is crucial for this immune response. First, CD1.1 transfectants were able to support an α-GalCer-mediated activation, which can be blocked by specific mAbs, while their untransfected counterparts remained inactive. Second, the ability to respond to α-GalCer correlates with the level of mCD1 expression on several cell types, including normal spleen cells and T cell hybridomas. Third, APC from mCD1-deficient mice cannot support an α-GalCer-mediated response. While these data indicate an important role for mCD1 in the α-GalCer-specific immune response, one may argue that mCD1 could be involved in the initial uptake of the α-GalCer for subsequent presentation by some other molecule. We consider this unlikely, however, because α-GalCer can be presented by fixed or concanamycin A-treated APCs, because the cells stimulated by α-GalCer are to varying extents also autoreactive with mCD1 molecules, and because T cells from mCD1-deficient mice cannot react to α-GalCer presented by wild-type APCs. Furthermore, preliminary data indicate that soluble mCD1 molecules can bind in vitro to α-GalCer (J. Maher, O. Naidenko, and M. Kronenberg, unpublished observations). Collectively, these data indicate that mCD1 presents α-GalCer to T cells, which most likely are selected by mCD1 molecules. Because data from several experimental systems also indicate that mCD1 molecules can specifically bind and present peptides (11, 12), this raises the interesting issue of how such chemically distinct types of Ags can interact with the same Ag-presenting molecule. Competition experiments indicate that a 1000-fold excess of p99, a CD1-binding peptide (11), does not inhibit the stimulatory effect of α-GalCer in any of our in vitro tests (data not shown). Our results give insight into the diversity of the TCRs capable of reacting with α-GalCer presented by mCD1. While we cannot exclude the possibility that there are few α-GalCer-reactive T cells that do not express Vα14, the results in this study, together with the results from Jα281−/− mice (41), indicate that the great majority of the responsive cells are NK T cells expressing the invariant Vα14Jα281 α-chain. The weaker response to α-GalCer obtained with hybridoma N38-2C12, however, suggests that the expression of Vα14 may not be sufficient to fully impart this specificity, implying a role for the β-chain as well. Vβ8.1/Vβ8.2 is not absolutely required, however, as hybridomas that express a Vβ7, Vβ8.3, or Vβ10 β-chain paired with the Vα14 α-chain are also stimulated by α-GalCer. Finally, junctional diversity during the rearrangement of the β-chains of the TCR also conceivably may influence the ability of TCRs to respond to α-GalCer. Such a heterogeneity in the NK T cell population was suggested previously by the different levels of mCD1 autoreactivity of N38-2C12 and DN3A4-1.2, a pair of T cell hybridomas that express Vβ8 and Vα14 (4 and Fig. 5⇑ without α-GalCer pulse), and by their differential sensitivity to the removal of the endosomal localization from mCD1 (4). Interestingly, the TCRs that determine reactivity to α-GalCer are those typical of a unique and specialized subset of T lymphocytes, the NK T cells. This population has been shown to be positively selected by mCD1 (20, 21, 22). Cytoflow analysis confirmed that, following addition of α-GalCer, the high levels of cytokine obtained were actually secreted by a small fraction of the total spleen cells (less than 3%). This fraction bears markers of NK T cells, including expression of NK receptors such as NK1.1 and Ly-49C, together with intermediate levels of TCRαβ. Our studies thereby confirm the amazing capacity of the NK T cells to secrete great quantities of cytokines during an Ag-specific activation, as already described following polyclonal or nonspecific stimulation of these cells (17, 49, 55). The mCD1 reactivity of NK T cells that has been documented in recent years (4, 14, 40, 56) is actually an in vitro autoreactivity. Although NK T cells express some markers that are typical of activated or memory cells, it remains to be determined whether these cells are truly autoreactive in vivo. While our previous data (4) and the work reported in this study indicate that the NK T cells probably recognize glycolipid ligands presented by mCD1, the natural mCD1-bound autologous ligand(s) that stimulates the majority population of Vα14+ NK T cells remains undefined. This study, and the work of Kawano et al. (41), provide strong evidence that α-monoglycoceramides are a ligand for NK T cells. α-GalCer was originally purified from a marine sponge (57), however, and while a very small amount may be sufficient for T cell stimulation, it is not significantly detectable in normal mammalian cells. We prefer the alternative possibility, that α-GalCer is a mimic for some related glycolipids compounds that are the natural autologous ligands for the Vα14+ NK T cells. These related compounds could be α-anomeric monoglycosphingolipids, which have been found in a few mammalian tissues, including the fetus (58) and the intestine (59). More interestingly perhaps, α-anomeric glycolipids also have been found in human colon tumors (60) and other drug-resistant cancer cells (61). It is therefore tempting to connect this potential tumor reactivity with the demonstrated antitumor activity of NK T cells (23, 24, 25, 26, 62). It should be emphasized that α-GalCer itself displays some potent antitumor activities in vivo (47, 63). The results from experiments using fixed APCs, inhibitor of endosomal acidification, and an mCD1 mutant all suggest that the presentation of α-GalCer to NK T cells by mCD1-transfected cells does not require endosomal acidification and Ag processing, when B cells or T cells were used as APCs. The glycolipid Ag itself has a relatively simple structure, consistent with the possibility that it does not need processing. α-GalCer has only one carbohydrate, and the shortening of its fatty acyl chains or sphingosine base only reduces its potency as an Ag (41). The binding of α-GalCer is likely to occur through the long fatty acyl chains and sphingosine base interacting with amino acids in the largely hydrophobic groove of mCD1 (8), while the sugar may interact with the TCR. By contrast to the data presented in this work with transfected cells, the results from the previous study (41) indicated that α-GalCer-mediated stimulation of Vα14Jα281 NK T cells derived from TCR transgenic mice is susceptible to inhibition by either chloroquine or concanamycin A, drugs known to prevent endosome acidification or transport to late endosomes. It is formally possible that, in the experiments reported in this work, spleen cells on the one hand, or the Vα14+ hybridomas on the other hand, pick up and process α-GalCer from the pulsed CD1.1-transfected cells, despite the extensive washing of these cells to remove nonspecifically bound α-GalCer. In this case, the responding cells themselves, rather than the treated or mutant mCD1-expressing APCs, would be presenting Ag. This is unlikely, however, because fixed APCs, the tail-deleted mCD1 mutant, or concanamycin A-treated CD1.1 transfectants all remained fully competent at presenting α-GalCer when tested with NK T cell hybridomas that express such low levels of mCD1 that they are unable to self-present α-GalCer (hybridoma N38-3C3, Figs. 6⇑A and 7B). The differing results between our study, using B cells and thymocytes, and the work of Kawano et al., using DC (41), might merely reflect the use of different types of APCs in the two sets of experiments. Data from in vitro binding studies suggest that the on rate for glycolipid binding to CD1 molecules is increased at acid pH (45 and J. Maher, unpublished results), and therefore, while processing of α-GalCer is not likely to be required, mCD1 Ag loading in some cell types may be enhanced at low pH. Alternatively, the requirement for endosomal acidification that Kawano et al. described may be a feature of the particular TCR analyzed in the Vβ8/Vα14Jα281 transgenic mice. In the past few years, NK T cells have been a focus of interest (for review, see Refs. 10, 56, and 64). They are proposed to bridge the innate and adaptive immune systems, either by serving as part of a first line of defense, and/or by serving as an important regulatory element that helps to direct the formation of polarized Th cell responses (10). The diverse roles for NK T cells reported in a variety of experimental systems (10, 56, 64) are most likely due to their ability to rapidly secrete large quantities of cytokines. In this regard, it is particularly noteworthy that some mCD1+ APCs, including A20 and RMA-S transfectants, induced NK T cells to secrete only IFN-γ, while purified DC or unfractionated spleen cells led to the production by the same responding cell populations of both IFN-γ and significant amounts of IL-4. Additional experiments are now underway to probe the requirements for costimulatory molecule expression, mCD1-bound ligand, and other requirements governing the regulation of cytokine secretion by NK T cells. Considering the strong homology between mouse and human NK T cells (16, 65), such studies potentially may yield important information on the in vivo regulation of both mouse and human immune responses. We are grateful to Drs. S. Cardell (Lund University, Lund Sweden), M. Bix, and R. Locksley (University of California, San Francisco) for kindly providing CD1-autoreactive hybridomas. We thank Dr. M. Corr (University of California, San Diego) for generously providing EL-4 and EL-4 CD1.1-transfected cell lines, and Dr. A. Franco (La Jolla Institute for Allergy and Immunology, San Diego, CA) for providing the class II-reactive T cell hybridoma D011.10. We thank Dr. B. Bothner (Scripps Research Institute, San Diego, CA) for mass spectrometry analysis of lipoglycans. We acknowledge Dr. K. Watanabe (Ehime University) for providing synthetic phosphatidylinositol dimannoside, and Dr. John Belisle (Colorado State University) for providing lipoarabinomannan. We also thank Drs. Shabnam Tangri, Juli Maher, Ted Prigozy, and Howard Grey for critical review of the manuscript. ↵1 This work was supported by National Institutes of Health Research Grants CA52511 and AI40617 (to M.K.) and AI40171 (to M.J.G. ), a grant from Association pour la Recherche contre le Cancer (N.B. ), and a grant from Medical Research of Canada (L.B.). M.J.G. is a scholar of Leukemia Society of America. This is manuscript 219 of La Jolla Institute for Allergy and Immunology. ↵2 Present address: Millenium Biotherapeutics, Inc., 40 Erie St., Cambridge, MA 02139. ↵4 Abbreviations used in this paper: β2m, β2-microglobulin; DC, dendritic cell; GalCer, galactosylceramide; LAM, lipoarabinomannan; mCD1, mouse CD1; PE, phycoerythrin; PI, phosphatidylinositol; PIM2, phosphatidylinositol dimannoside.